All we know, WhatsApp messenger being the most popular messenger among the world. I have already written many tips regarding WhatsApp. WhatsApp give us so many facilities, including fast and simple chat. If you face any issues due to WhatsApp, like harassment from other WhatsApp users, high usage of mobile data etc, you may wish to stop the WhatsApp services. We can stop personal harassment by blocking those persons, but you should stop WhatsApp service forever for others reasons problems. How can you to stop the WhatsApp services? 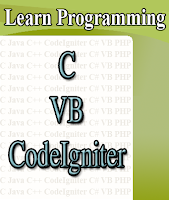 Commonly there are two ways, both are popular. The first method is uninstalling the WhatsApp using default Android application manager. For this open phone settings, take ‘Application Manager’ or ‘Apps’ or like that, there you can see all the applications that you were installed on your phone. Tap and select 'WhatsApp', there you can see a button named ‘Uninstall’. By taping the button, your WhatsApp will be deleted. Uninstalling may delete all your whatsapp media, especially chat history. So you may backup your WhatsApp messages before going to uninstall. This method is just removing your whatsapp application from your phone. Here your whatsapp account is still there, and you will not exited by any whatsapp group. If you reinstall whatsapp, then all your groups will be there. But if you re-activate your account after some months, then you may be removed from all groups automatically. Sometimes, while reinstalling process, they may find your old backup file, so you can retrieve all your old messages. 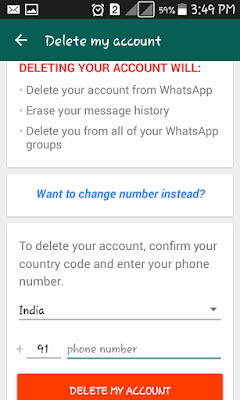 Second method is deleting the original WhatsApp account. If you delete or deactivate your account, then your number will be a normal phone number (not a WhatsApp activated number). Here you will be exited / removed from all groups automatically. If you reactivate your account again, then all the procedures for installation are necessary like verifying phone number, setting name, profile picture etc. 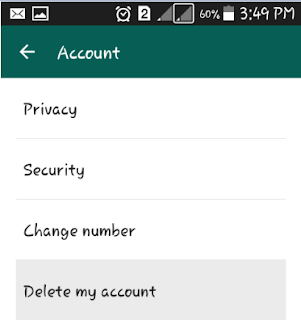 To delete your account, open the whatsapp Settings, tap the ‘Account’. 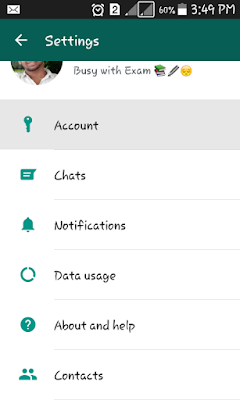 Here you can see the settings regarding to your whatsapp account. At last, you can see ‘Delete my Account’. Now your mobile number is not a WhatsApp registered number. 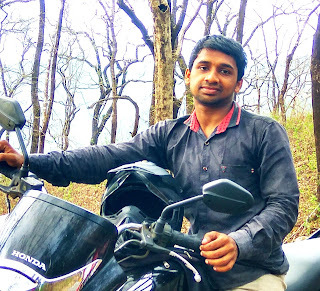 You are fully free from WhatsApp network.